This m/c is suitable for handling small casting work piece or zinc & aluminium die castings, those processing barrel which rotated in low speed and continuously, mean while, the work piece surface will be shoted steelball by shot wheelabrators in hi-speed and continuously also, after then, the casting sand, scaling & b.. 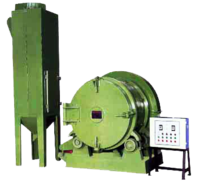 This m/c processing is combined the tumbling barrel and dumping bucket which convenient for storage small castings, zinc & aluminium die castings and the odds can be loaded in whole, the processing work piece be dumped in tumbling barrel which rotated in low speed and continuously, meanwhile, the work piece surface wil.. The work piece be hanged on the hanging fixture out of machine and which swinged slowly get into the blasting chamber for then, the work piece surface will be shoted steel ball by shot wheelabrator in hi-speed and continuously, but the hang work piece turned in low speed, Since, the work piece surface will be shoted ev.. This m/c is employed hoist and rotating hanger to hang work piece, for then, the work piece surface will be shoted steel ball by shot wheelabrator in hi-speed and continuously, but the hang work piece turned in low speed, Since, the work piece surface will be shoted evenly, after that, the casting sand, scaling & burri..